One Mom's Moxie: $200 Mix1 Giveaway!!! 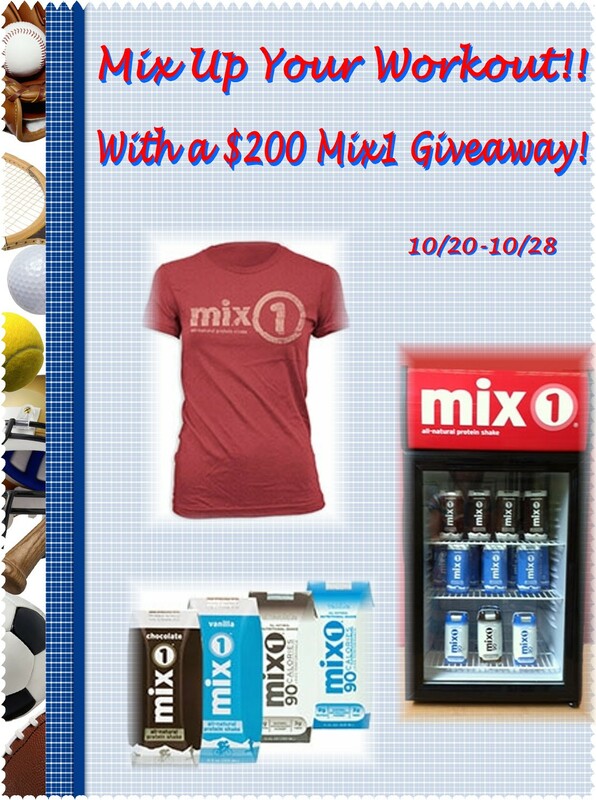 Mix Up Your Workout with a Mix1 Giveaway! Do you feel like you are in a bit of a workout slump? Maybe you need an energizing new way to get your body back in motion! Mix1 products contain only the highest-quality, all-natural ingredients including whey protein, carbohydrates, antioxidants, soluble fiber and healthy fat. They use the right balance of these ingredients, at effective levels, to provide the maximum benefit to your body before a workout, after a workout, or throughout your day. These healthy, all-natural protein shake provide pre-workout fuel and post-workout recovery. Great to use in the morning to get you up and moving! What to see what mix1 is all about? One lucky winner will receive an awesome “Mix up your workout” package which includes a case of a variety of mix1 chocolate and vanilla shakes, a cool tee-shirt and a super neat mini-cooler. The package is worth about $200! Special Thank you to the Amazing Blogs Participating in this event , make sure you stop in and tell them "hello" I am lost without them all! !